If you have seen the Painted Ladies on Alamo Square with the City Skyline in the background, you have seen an important part of District 6. This is an interesting area, in that there are areas of great transition with great potential. Lower Pacific Heights, the Western Addition, and the North Panhandle (now known as NOPA) are full of unit buildings with architectural integrity and much potential for owner occupancy of rental property and condominium conversion. NOPA is the new hot ticket and has a hip demographic. The show ‘Full House’, although the opening credits are on Alamo Square, is actually at 1709 Broderick in Lower Pacific Heights. Hayes Valley is already trendy and very dense, has great shops and restaurants and is well located at the center of the City for convenient freeway and public transportation access. This area is also near City Hall, the Symphony and the Opera. 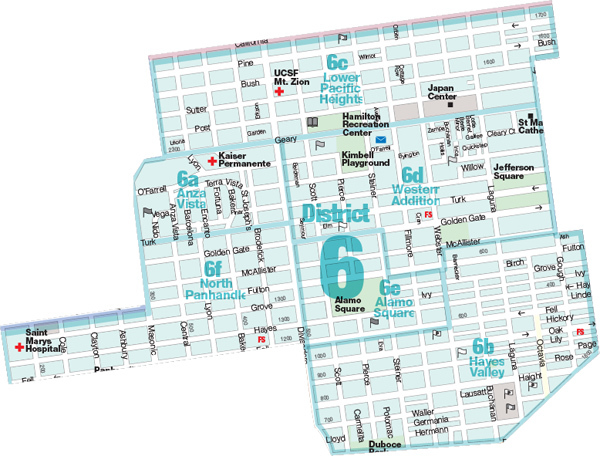 The main shopping areas are Hayes St. and Divisadero St.